Everyone knows that London in the Sixties was a cool place to be, but few know that this was true not only for music, art and fashion, but also for psychology. At the Institute of Psychiatry you could find an amazingly glamorous pair of psychologists. Distinctively handsome and flaunting sartorial elegance, they were the spitting image of The Avengers as portrayed by Patrick McNee and Emma Peel. Like these fictional characters, Neil O’Connor and Beate (Ati) Hermelin worked together to solve baffling problems with wit and consummate ease and projected a refreshingly unsentimental, unconventional outlook. Their background was unconventional too. Ati was born in Berlin and her accent left you in no doubt about this. In fact she always proudly declared herself a Prussian and loved to quote from the German classics. She grew up in a highly cultured Jewish family. Her uncle was Karl Fliess, and she had met Sigmund Freud as a child. Ati was always fearless and proud, and after Hitler came to power she decided, still a teenager, to flee with a boyfriend to Palestine. Fortunately, her family survived the war in Switzerland. She attended art school in Jerusalem, living through exciting times, and eventually came to London with her film-maker husband. Out of curiosity Ati went to some evening classes run by Alan and Ann Clarke, and they encouraged her to take up psychology at Reading University. From then on Ati devoted her life entirely to research. After her PhD she became a member of the scientific staff of the Medical Research Council. In her later years, she was Emeritus Professor at Goldsmiths where she continued to dazzle students with her sense of style and her sharp intelligence. Ati had a happy and lasting marriage, as did Neil, and just as in The Avengers, this could not fail but lend a certain frisson to their relationship. Not many people knew that Neil was born in Kalgoorlie, a remote Australian mining town, because he always behaved in the classical English manner, complete with dark tailored suits, ironically raised eyebrows and a love of sport cars. But he lent this image a touch of quirkiness by sporting a monocle. 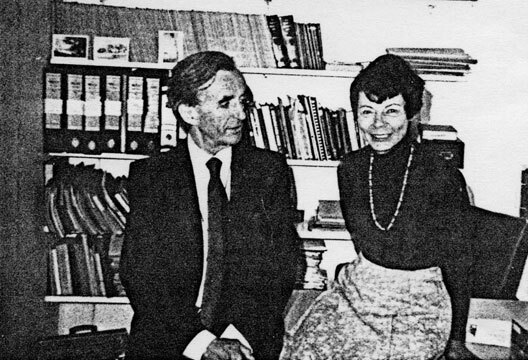 Nor was it generally known that Neil was a lifelong member of the Communist Party with a wide circle of like-minded intellectual friends who often met in his fabulous house and garden bordering Richmond Park. He also had fruitful contacts with eminent Soviet psychologists, such as Luria. After war service in India, Neil went to Oxford and started his distinguished research career, first with Jack Tizard, then with Ati Hermelin, investigating cognitive processes in individuals who were then called subnormal or mentally defective. Their groundbreaking studies established that these individuals were capable of far more than had been expected, and that there were subgroups that were interestingly different. Neil O’Connor is remembered by the BPS award that is made every year for research on cognitive abnormalities. He was Director of the MRC Developmental Psychology Unit from 1968 until 1982, and I had the good fortune to be hired by him after completing my PhD thesis, which he and Ati had supervised. Hermelin and O’Connor, or O’Connor and Hermelin (they strictly rotated the order of names in their publications) were pioneering researchers in the field of developmental disorders. In line with their amazing history and lifestyle, their work was never dull. Their experiments have invariably been described as elegant, and were written up in a style which may strike us today as remarkably uncompromising and terse. As a rule they produced a book at the end of a particular period of experimentation, in phase with their regular research proposals to the MRC. They liked nothing better than to get critical acclaim from rigorous experimental psychologists who pioneered methods in cognitive psychology. They admired the work of people such as R. Conrad, Donald Broadbent, Anne Treisman and Elisabeth Warrington, and they could be acerbically critical of work they perceived as shoddy or hyped. Hermelin and O’Connor’s work between the 1960s and the 1980s was groundbreaking because it introduced the then revolutionary theories of information processing and the rigorous methods of experimental psychology to the study of intellectual disability. In this way their work is foundational to studies in the field of developmental disorders today. Methodological innovations, such as the use of mental-age-matched control groups, have had lasting impact. When groups are matched by their performance on relevant tests, say vocabulary level (translatable into verbal mental age), then it becomes interesting when they differ on experimental tests of verbal memory. In this way they were able to demonstrate that autistic children of quite limited verbal ability nevertheless exhibited superior verbal rote memory. After autism, Neil and Ati turned to the study of specific sensory handicap, which they systematically contrasted with general mental handicap. This work made a critical contribution to the apparently highly modular view of the mind. Furthermore, it led to new insights on the representation of space and time. Thus they explored the then radical idea that vision drew on spatial while audition drew on temporal representations. By ingenious experiments where duration in terms of time and length in terms of space had to be remembered, they showed that people born blind had a different appreciation of space and time than those who were born deaf. O’Connor and Hermelin’s later work on idiots savants has established the value of experimental approaches to this phenomenon. The phenomena that they attempted to penetrate are some of the most puzzling in the field of developmental disorders. They travelled all over the country to examine calendar calculators, for example. They took immense delight at finding otherwise hidden talents and genuinely appreciated the art of the savants. They always maintained that at the root there is some innate ability, but they also showed that obsessive interests and hours of dedicated practice were necessary if not sufficient conditions. In 2000, when already over the age of 80, Ati wrote a monograph which tells the story of this work. Bright Splinters of the Mind was dedicated to Neil, who had died in 1997 as a result of a collision with a bicyclist while on the way to his office. Where are such heroes of psychology now? I am sure that 40 years from now someone will remember one or two colourful protagonists who are only just beginning to make their mark. The Hipp chronoscope, or Hipp’s chronoscope, was known in England as the Wheatstone-Hipp chronoscope because the instrument built by Mathias Hipp in 1842 was a modified version of Charles Wheatstone’s original design from around 1840 (Edgell & Symes, 1906). Used for measuring reaction times, in optimum conditions, it was accurate to 1000th of a second. The clock was driven by means of a weight let down by wheels. This part of the mechanism was started by pulling one cord and stopped with the other. There were two clock faces, each with an indicator: the lower one measured tenths of seconds and the upper one measured thousandths. The clockwork worked continuously, but the indicators only moved when a current was passed through their electromagnets. They stopped again when the current was broken (Schulze, 1912). Therefore, when used in experiments, the scientist would arrange it so that the stimulus would close the circuit and the participant’s reaction would open it again. However, the apparatus suffered from weaknesses. There were two electromagnets, and the mechanics by which the clocks were connected to and released from them had to be in perfect balance. This aspect was particularly subject to atmospheric conditions and temperature changes. The strength of the currents also needed to be continually measured and kept constant throughout the experiment. On 21 November 1883 James McKeen Cattell, who was working with this equipment, wrote in his journal: ‘The two currents were not always simultaneously closed, and the stronger the current the shorter the time recorded by the clock’ (Sokal, 1981, p.99). He set to work designing improvements to the chronoscope and exchanged ideas with his friend Gustav Oscar Berger about how to do it. On 26 September 1884 Cattell wrote to his father: ‘Yesterday morning I had rather an amusing adventure… Before I was up in the morning a police officer came to examine my pass. Of course I had none, and so was taken to the police department, where I was examined in a most absurd way… All my letters were read – the one from Berger described my Kronoscope which they seemed to consider a very suspicious piece of apparatus. The prefect, or whoever he was, told me I might have to be kept in custody a week until they could find out if my story was true’ (Sokal, 1981, p.120). In fact Cattell was only held in custody for four hours and on 5 January 1885 when he wrote to his parents he reported: ‘Berger turned up early this morning and we started work. By way of variety not one but both electric batteries were out of order. You have no idea how much one must fuss over apparatus. The trouble is not that one must know physics, but that he must be an original investigator in physics’ (Sokal, 1981, p.151). The Hipp chronoscope kept experimental psychologists occupied for many years. For instance Cattell added a spring (Sokal, 1981), Wundt and Ebbinghaus both invented additional equipment for balancing the apparatus prior to use, and Schulze replaced the electromagnets with polarised electromagnets (Schulze, 1912). Chronoscopes were, after all, extremely useful in the work of late 19th- and early 20th-century experimental psychologists. Edgell, B. & Symes, W.L. (1906). The Wheatstone-Hipp chronoscope: Its adjustments, accuracy and control. British Journal of Psychology, 2, 58-88. Sokal, M.M. (Ed.) (1981). An education in psychology: James McKeen Cattell’s letters from Germany and England, 1880–1888. Cambridge, MA: Massachusetts Institute of Technology Press.